CUMTD #410 one of a group of 15 purchased in 1994 from the Transit Authority of the River City of Louisville, KY, at Goodwin Avenue & Nevada Street in Urbana. 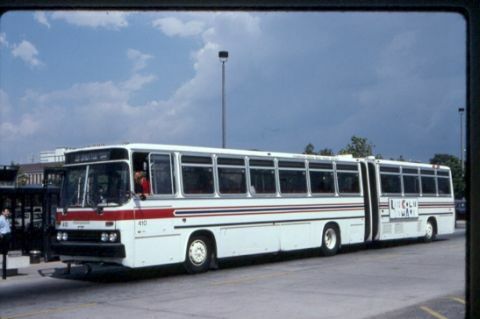 These buses were acquired after a successful test using Indianapolis MAN artics. on campus routes in January of 1994. Photograph taken September 13, 1995 by A.J. Reinschmidt.